When it comes to maintaining a successful site, making sure that you have everything going the right direction for it to be as successful as it should be, you want traffic to be directed to your site and you are competing with others. So, making sure that every element is going to contribute towards giving it a good reputation in the interwebs. One of this is the page speed. Not a lot of people may be aware of this, but page speed can actually be a determinant on how a site is going to be ranked by search engine. Page speed has something to do with the length of time that it takes for the pages in your site to load. It is a common fact that there are sites that seem to easily open up the moment you get directed to them while there are those that may take ages to actually load. Naturally, users would prefer going for sites that will load a lot faster. 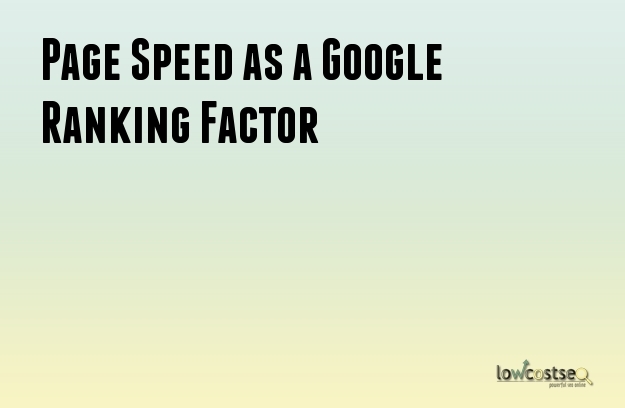 Google has actually indicated that the site speed as well as the page speed are among the signals that it takes into consideration when using its algorithm towards coming up with page rankings. Many researches have revealed that the search engine is actually doing this by measuring the time it will take for the site to reach the first byte when it comes to considering page speed. Naturally, pages that are able to load up a lot faster are getting ranked higher by the search engines after all, when a page takes a longer time to load, the search engine will only be able to crawl fewer pages while using the budget that they have allocated for crawling purposes. This is why it can really affect negatively to the indexing of a site if it is designed to actually load a bit slower when compared to how other sites have fared. Aside from affecting the search results ranking, the page speed is also known to affect the experience of the user. If a page takes a longer time to properly load, it is likely to have a much higher bounce rate when compared to sites that takes a short time to fully display. Most people get impatient when they have to wait longer of page to load up and hence, will have a tendency to actually click it close and find a similar sit that loads faster. So if you are after conversion, which every site out there is, then slow page speed is definitely not going to do you any good at all. To achieve a page that is going to load faster make sure that you enable file compression. Files that are larger than 150 bytes should be reduced. Optimizing the code can also help increase the page speed as well. It helps too to reduce the redirects on your page as this removes the waiting them for the user to wait for the request-response cycle for the HTTP to complete. Improving the response time of the server is also a good idea, in addition, make sure that the images you upload are going to one optimized to make sure that they will note any larger than what they require to be.